We didn’t sleep well, still adjusting to the time change. But is should surprise no one that we still made a full day of it. Breakfast at the hotel, then onto the U. We had bought 24 hour passes on the public transit system that cost only the amount of 4 one-way trips cant imagine that in DC. 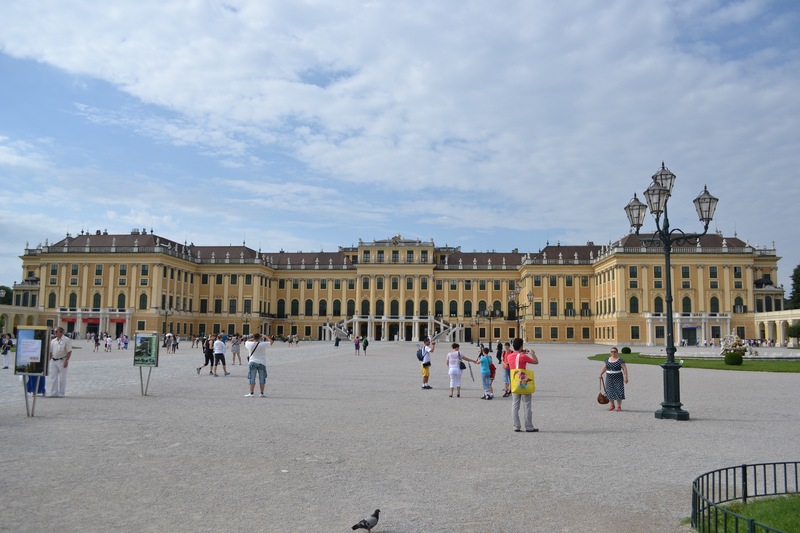 We took 2 trains to Schonbrunn Palace. 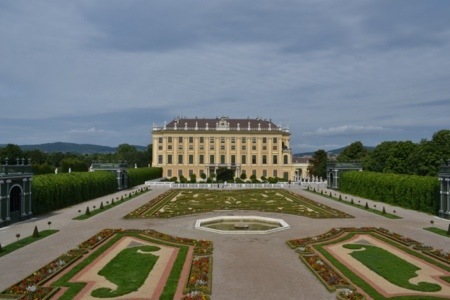 Billed by Rick Steves as 2nd only to Versailles, it was the summer home to the Habsburgs. We had purchased tickets online so we were able to avoid lines and go right in. The tour included audio guides, and we saw dozens of ornate rooms. We then walked the gardens outside. It was a pleasant day, not nearly as hot as yesterday. The grounds were a delight, would be glad to have a summer home like that! We then took the U back into town. We ate lunch at Rosenberger Markt, the same place we had lunch during our river boat cruise in 2005. We both had salads, feeling a need to eat a healthy, light meal. Next, we went to the Albertina Museum. We had seen ads at the airport for a Picasso and Monet exhibit. It was good, but the highlight was several Habsburg staterooms. Unlike the places, you could walk though them and get close to the paintings, wallpaper and furniture. 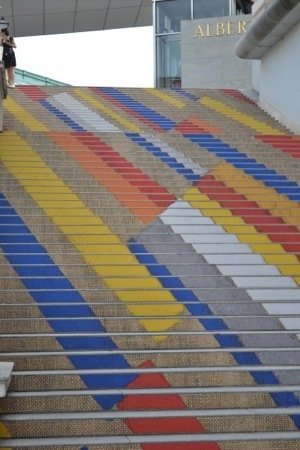 On the way down from the steps from the museum, Ellen noticed a design on the steps. 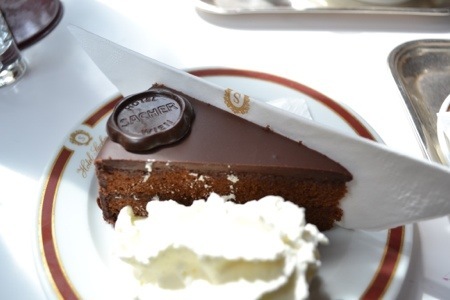 We could not leave Vienna without a return trip to theCafe Sacher, home to the Sacher Torte. It did not disappoint. 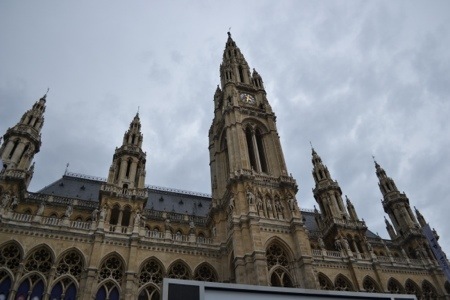 We had seen the Radhaus, the town hall yesterday from a distance and wanted to see it up close. We took the U and enjoyed a walk around it. A film festival plays on a large screen in the summer, with mini-restaurants set up around it. With more time, would have been a great place to hang. It was time to take a quick rest back at the hotel. I used the time to try to fix my SIM card issue, talking to Apple in Austria and Verizon Wireless back home. Fingers are pointing in all directions, but I’m now believing the problem might be with Orange here in Vienna. So maybe we’ll get it fixed after Bratislava. We had our first real dinner of the trip at a restaurant Ellen had found in the guidebooks,Oesterricher Im Mak. 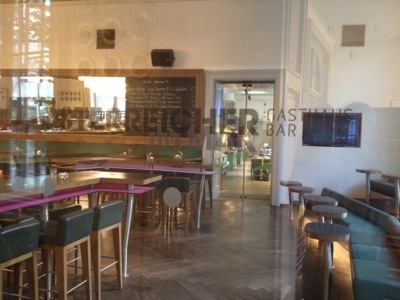 Known for modern versions of traditional Austrian food, we had a delightful meal. I had a roast vanilla dish, which is beef with garlic, and surprisingly no vanilla. It was delicious. We strolled back to the hotel, and will leave Austria tomorrow briefly for a quick stay in Bratislava.